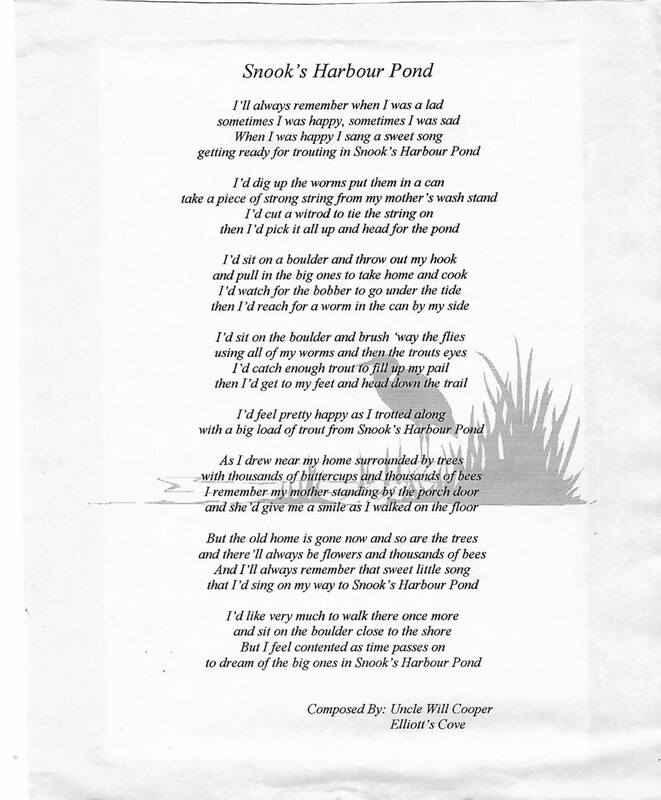 I’ve written a little about Aunt Ethel and Uncle Will before, but something I did know, but had forgotten was that Uncle Will wrote quite a bit of poetry. I know I’ve seen this before, but had completely forgotten it, or where. Thanks to Eric Cooper for the picture. Enjoy and reminisce a bit. Peter thanks so much for sharing this poem Grampy wrote. I can hear him now reciting it to me . I memorized this poem and there are a few more I have that he wrote . Dad used to tell me that Uncle Hay Cooper would always love to sit on the big boulder and fish. And more often than not he would come home with a couple nice trout. “Snook’s Harbour Pond” was printed in The Clarenville Packet on Thursday Augest 24, 1972, page 12. How did that come to be? Well, that same year my sister Darlene and I spent our summer holiday at our Nanny and Grampys Coopers home in Elliott’s Cove. One day I came across this particular poem and was so taken up with what he had wriiten.He later took me aside and said that he would like to submit his poem to the Packet but with one condition, only if I would pen one also. Well you can only imagine how excited I was to given such an honourable task since I had such love and admiration for this man. That day I quickly got to work and before my vacation was over our poems were publised. The day Grampy gave me my copy was a time in my childhood that will always cherish. I still have that copy today and pull it out now and then. Eventhough I am proud of the poem I wrote that summer, it will never compare to his way with words. Just thought I would like to share that with you all. P.S excuse my grammer.